Dovecote Afloat project, Bringing the Magic of the Canal & River to Children & Young People is proud to announce reaching the finals of the Children & Young Peoples Now Awards in November 2016. 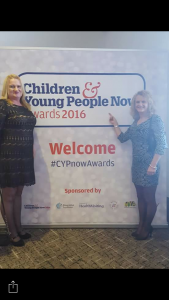 Did you know that the Children & Young People Now Awards are the gold standard for everyone working with children, young people and families. These awards provide a great source of pride and recognition for all those who strive day in, day out, to improve the lives of others. The event also presents a tremendous showcase of learning and best practice from across the country that can be an inspiration to all. An amazing glitzy evening was had by all who attended. It was a great opportunity to network and celebrate all the fabulous work taking place supporting vulnerable children, young people and families around the country. Who knows maybe we will reach the finals next year for our centre based activities!